Jugaad Hostels i New Delhi, Indien: Reservér nu! Welcome to Jugaad, your hook-up for an amazing time in Delhi and India. 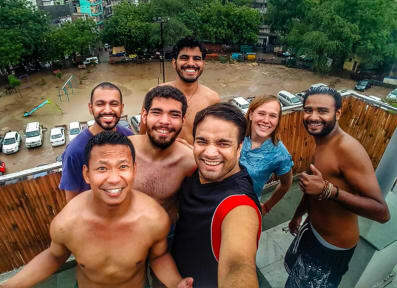 The idea behind Jugaad Hostels is having a rocking time at rock bottom prices and having a local experience of the destination without breaking the bank. Jugaad is NOT located in the touristy and backpacker’s ghetto of Main Bazaar or Paharganj, but in an urban village in upscale South Delhi. This is an ideal setting to experience the city like a local away from the travel scams and the aggressiveness that everyone associates Delhi with. The only hostel in India with multiple Attached/Ensuite Showers and Loos. Jugaad is only a 30min drive from the airport and same from the big railway and bus stations. 3kms from the Green Park Metro station and walking distance from Hauz Khas Village….the art and cafe district of Delhi. Only 20mins or a quick metro ride from the City center, 15 mins from Qutab Minar and Humayuns tomb besides some other popular sights. We are a stones throw(if you can throw a stone 2-3kms) from Sarojini Nagar and Dilli Haat the most popular street bazaar and handicrafts market in Delhi. 1 Huge rooftop with beautiful panoramic views of the city. 24 hrs Front desk. Check-in at anytime and no curfews. Special discounts and deals at the best clubs, pubs and restaurants. We will send you a very detailed welcome email when you book. Please read it carefully and closely. It is very helpful. A place I would recommend to anyone who goes to Delhi. The staff is super nice - willing to help and is up for exploring with you.